1) Heat the onion and fry the chicken in a pan with the olive oil. When it’s brown outside, pour in a large pot. Add the sliced carrots, leek, courgette and the pumpkin cubes. Sprinkle with saffron, salt, pepper and add the tomatoes. Sprinkle some Ras-el-Hanout and add some fresh coriander. Cover with water and cook for 20 min. 2) When the vegetables are tender, add the rinsed chickpeas and some more spice/coriander if needed. 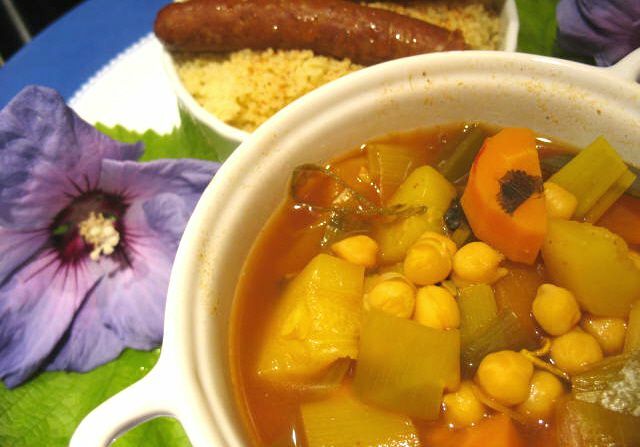 Serve with spicy lamb sausages and couscous seed + one portion of the boiled chicken. * Tip : Use your own pumpkin peeled and cut in the autumn and portioned in little bags in your freezer.